Wie aus einer Idee die größte Modellanlage der Welt wurde. Laufzeit gesamt: über 2 Stunden! HOW AN IDEA TURNED INTO THE WORLD’S LARGEST MODEL LAYOUT What started as a crazy idea about 15 years ago is now a fascination for millions of people from around the globe. On this 2-disc DVD you’ll learn how it all began. 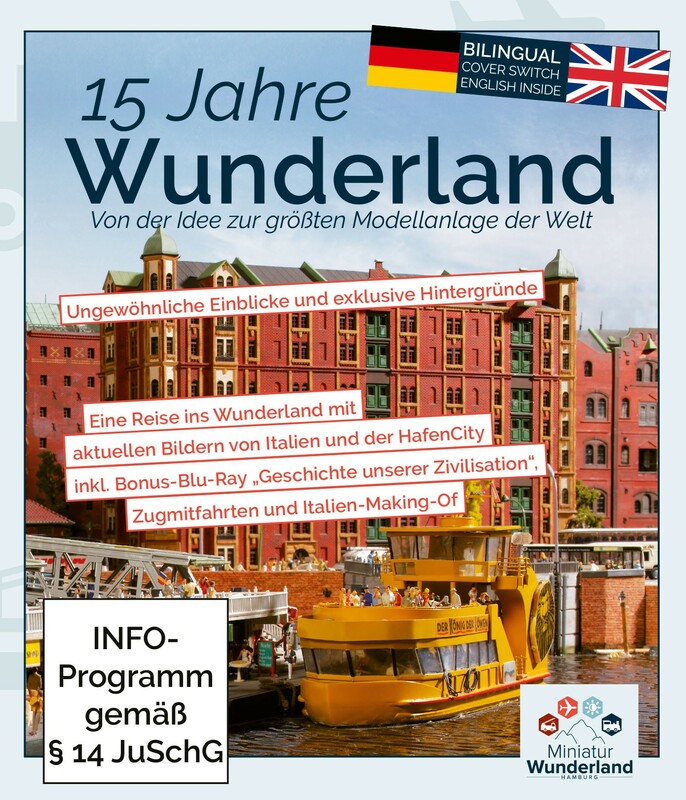 Join the founders of the Miniatur Wunderland on an exciting discovery trip with shooting locations all over Germany and Switzerland. Where did Frederick Braun come up with the idea to build such a layout? You’ll find out here. Have you ever wondered how model figures are made? We’ll explain it to you. Experience an unusual view from the inside of a bridge and marvel at exclusive shots that show how it all began. This 2-disc DVD is filled with interesting facts and fascinating images from the world’s largest model railway layout. We’ll show you the most beautiful spots of the layout. Of course, there are also new images from the airport section. Experience the exciting atmosphere of the new airport. There are airplanes taking off and landing every few seconds! INCLUDES MANY EXTRAS Have you missed one of the numerous push-button actions? No problem, on the bonus DVD you can see them all in a row! 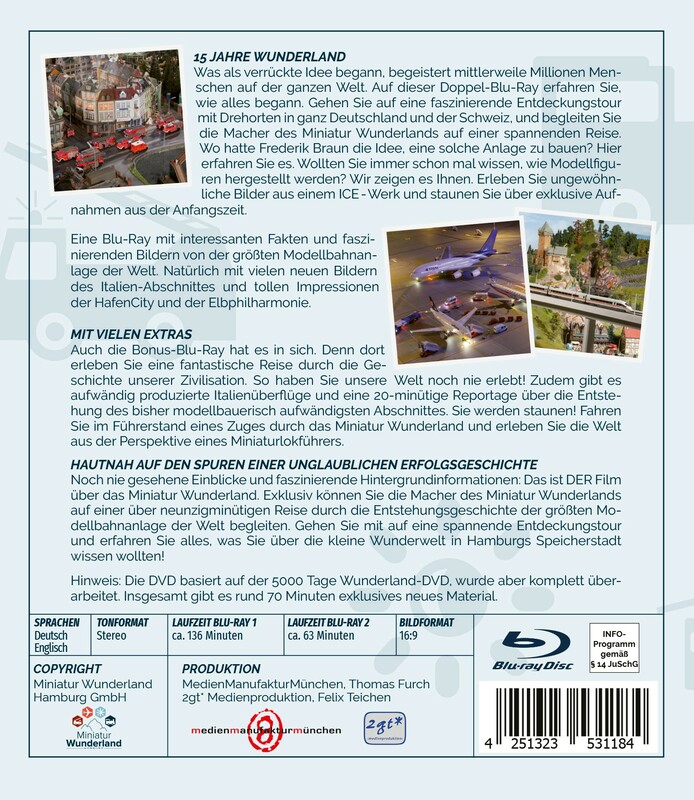 You have never seen this big (and yet so small) world in Hamburg’s warehouse district quite like this: On this DVD you’ll find over 20 minutes of spectacular flights over the layout. You’ll be amazed! Drive with us through the Miniatur Wunderland, either from inside the driver’s cabin of a train or behind the wheel of a truck. 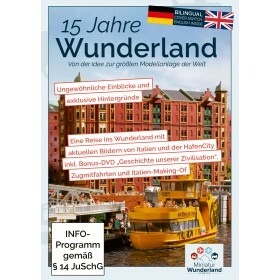 And, of course, you’ll discover interesting background information about the Miniatur Wunderland in exclusive interviews. UP CLOSE ON AN INCREDIBLE SUCCESS STORY Never before seen insights and fascinating background information: In celebration of the 10-year anniversary, we bring you THE movie about the Miniatur Wunderland. Now you can join the founders of the Miniatur Wunderland on a 70-minute journey through the origins of the world’s largest model railway layout. Come along on this exciting discovery and learn everything you want to know about this little world of wonder in Hamburg’s historic warehouse district!